Reviewing a number of game theory results the authors Crawford, Costa-Gomes, and Iriberri (2013) discuss why people often deviate systematically from equilibrium in game theory. By understanding why some choices appear irrational (level-k) it is possible to better determine under what circumstances such behavior is prevalent. Their paper reviews and analyzes a large swath of game theory results to make some conclusions. 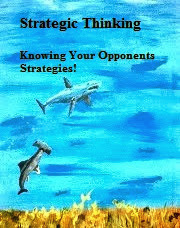 Strategic thinking is a natural part of everyone’s life and influences everything from school choice to business decisions. In game theory each person seeks to maximize their payoffs based upon predicting the choices of others by assuming the rationality of the other players. This is called bounded rationality as all players work under the same assumptions. There is also something called level-k responses. It is an assumption that all players actions will improve in an attempt to take the dominant stance that eventually leads to equilibrium. A level-k response would indicate that a person is making decisions outside of shared understandings of “rational” choice. This indicates the person’s cognitive model and assumptions of the game may be different than other players. Because there is a lack of information when a game starts, some players recognize this ambiguity and avoid dominant positions that often fit within the equilibrium model. Each person responds to the game with a personality type that impacts the types of decisions they make. It is their personal beliefs that help them develop a strategy for dealing with the components of a game and choosing certain patterns. Equilibrium is seen as rationality with a common belief among players. The more evidence a person obtains from the game the more accurate and rational their decisions. Players often make larger and wilder maneuvers in the beginning of a game and then move to define choices toward the later part of the game as they begin to understand the rules. Using a concept called level-k models it is possible to see how certain behaviors move away from equilibrium choices and under what circumstances such behavior can be expected. Many poor decisions may be made from a lack of time, information, or cognitive deficiencies. Yet it is possible to find that level-k decision-making may have some advantages in resolving games and conflict. In a level–k decision it is believed that the player is making decisions regardless of the other players within the game. Level-1 players have higher cognitive hierarchies than Level-0 players and believe others are playing at a lower level. So and so forth up the chain of complexity. Higher level thinkers (i.e. L3 players) may come to the conclusion that the game takes into account many different levels of strategic thinkers and their actions are based upon the aspects of their complex environment. Expanding on the concepts within the paper it is important to make a distinction between irrational behavior and perceived irrational behavior. In small games with clearly defined rules the rational choices are obvious. In larger games without restrictions, what is seen by one as irrational choice may yet be the most rational choice. These choices may depend on objective, environmental testing behavior, countering limited thinking of other players, or even drawing in the behavior of other players. Strategic thinking is important as organizations seek to move from local to global marketplaces where the environment has many more options and choices. The perception of rationality is based upon the abilities of those who are doing the judging and their ability to understand the environment or the behavior. As cognitive complexity rises so does the ability of individuals to make choices where the strategic purpose of the decisions are not immediately apparent to lower level thinkers. This could be an advantage in and of itself. Crawford, V., et. al. (2013) Structural models of nonequilibrium strategic thinking: theory, evidence and applications. Journal of Economic Literature, 51 (1).